What WikiLeaks might have meant by that anti-Semitic tweet. WikiLeaks has had a big few days. On Friday, Julian Assange’s organization released about 20,000 emails from the Democratic National Committee, embarrassing the group to the point that chairwoman Debbie Wasserman Schultz was forced to resign. Hillary Clinton’s campaign has blamed Russia for the leak, which they said was done for the benefit of Donald Trump. Perhaps lost in the brouhaha, though, was the fact that over the weekend WikiLeaks—an organization that claims to be devoted to radical transparency—sent out an anti-Semitic tweet and then deleted it. Tribalism is a noun meaning “an advocate or practitioner of strong loyalty to one’s own tribe or social group.” Jewish “tribalism” is a theory of Jews working in concert to control world events for the benefit of Jews, espoused by such notable white supremacists as David Duke. Perhaps the most difficult bit to understand, and the most important part, is the “[most] of our critics have 3 (((brackets around their names))) & have black-rim glasses” part. The brackets is a reference to an alt-right meme that was a way of signaling that a person was Jewish, often for anti-Semitic commentary (some Jews later co-opted the meme and used it as a self-identifier). Black-rimmed glasses are a style of eyewear sometimes associated with the notable Jewish comedian and director Woody Allen. They are also worn by many different people. So, one possible meaning: Jews are climbers among an elite and powerful group who use a symbol that indicates strong loyalty to other Jews. 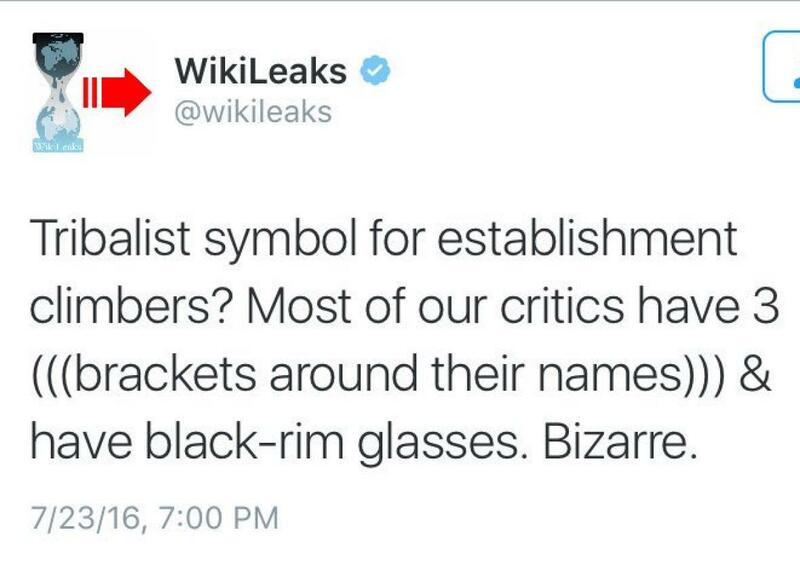 These types of people (Jews) also often wear black-rim glasses and are WikiLeaks’ biggest critics. This is an odd (perhaps nefarious?) thing. No. We deleted it because it was been intentionally miscomprehended by pro-Clinton hacks and by Neo-Nazis. It’s unclear who writes the WikiLeaks Twitter feed. Assange in the past has reportedly said that there is a “Jewish” media conspiracy against him at the Guardian newspaper.